Cover comment: The carousel in the woods is very cool but I don't understand why this was chosen for the cover. There's only one scene with the carousel in the over 400 pages+ of this book. I would have expected a slice of pizza, a chain with a saint medallion, or even a guitar or fiddle as art. Standing in the shadows of anyone is never fun. When that individual is your older brother, a charismatic, good looking, larger than life individual, how can another compete or get a shred of attention for themselves? Sydney has lived her entire life with Peyton as the dominant force in her parent's eyes, especially her mother's. When he began getting into trouble, her folks tried to help him, but he needed to want help in the first place. When he gets behind the wheel of his car, inebriated, and hits a teen boy on a bike, Peyton receives a sentence and is jailed. Now Sydney has to live with the repercussions of his actions as well as his ghost in her life. 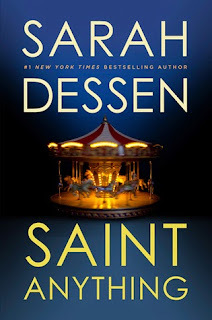 Saint Anything is typical Dessen from the quiet girl to the immensely likable secondary characters (here it's an entire family, the Chathams), the budding romance with a guy (Mac) and the journey of self-discovery. It's also one of her darkest toned books in a long time. I will immediately say I was surprised by the amount of telling in the beginning of the story which set-up the premise for Sydney's journey. Peyton's back story did slow down the pace for me, but since I already found Sydney a likable and highly sympathetic character (she calls herself "invisible"), I had to read on. That is what gets me with each and every Dessen book--the voice. The main character may not always be exciting or interesting, but their insight, the way they view the world and convey their feelings to the reader, is what hooks me and what has made me a fan of this author. When I read a Sarah Dessen book I know I will really get to know her MC because she writes such deep portrayals of teen girls. And I usually wind up loving the MC's best friend too. Sydney changes schools so she can begin over again while Peyton serves his sentence. It's hard standing in his shadow and the new public school she attends offers her anonymity. She meets Layla at a local pizzeria along with her brother, Mac. At school Layla seeks her out and brings Sydney into her group of friends. Sydney is accepted. This story has so much going on from Sydney's internal conflict of dealing with her feelings for Peyton and what he did, to the external of living with her grieving parents, to the secondary plots involving the creepy Ames, making friends and falling for someone. I did love Layla's outgoing personality and her dedication to her mother. Her entire family, no matter how dysfunctional, showed Sydney what family is all about. I did have some qualms about a few things in the book. The cover depicts a carousel and I wondered why. When the carousel was mentioned, it was only in one scene, and I really expected to see it used again, especially in a scene with Sydney and Mac. It wasn't. If something is showcased on a cover, I think it's going to be of importance. Why not have a medallion pictured instead? The story line with Ames built up and was tense (even though I had a hard time believing her parents couldn't see what was going on) and then ended rather weakly. And after so much was said about Peyton, I expected to see him with Sydney more, at least one 'big' scene between siblings later on. Even with my comments and concerns, I have to admit once I open a Sarah Dessen book, it's hard for me to put it down. I love the way she writes contemporary girls. Their voices always have a way of touching me, gripping a piece of my heart, and resonating with me. Whenever I read her books I make sure to keep a highlighter handy becasue I know I will be marking favorite passages. Saint Anything was no exception. My copy is marked up in yellow and also autographed since I was able to meet the author while she was on tour for this book. 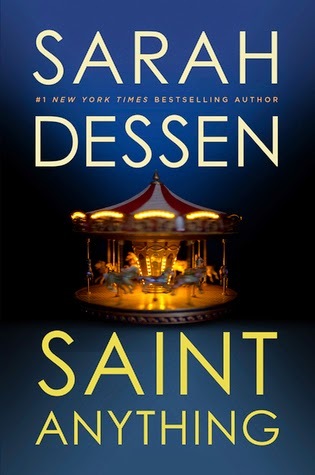 I always found Sarah Dessen to be a hit or miss. I enjoyed a few of her books but there was a few I didn't like either. Will definitely be checking this one out though since most reviews have been positive for this book. Great review.